LOCATION: This home is a 5 minute walk & a 1 minute bike ride to the beach. 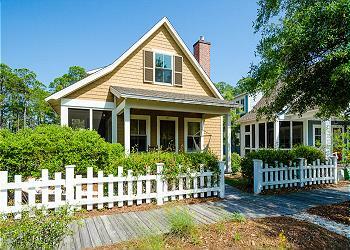 DETAILS: This two bedroom cottage charmer is perfect for your beach vacation. The cozy porches and relaxed feel will put you in the mood for some R & R. The light and airy living area joins the beautiful kitchen, which features stainless steel appliances, gorgeous wood cabinetry, and granite countertops. There is plenty of space for preparing meals and enjoying time together at the dining area that is attached. The first floor Master offers a wonderful retreat with its high ceilings and gorgeous furnishings. A connected bath features a beautiful tiled shower and a single vanity. Upstairs, the second bedroom with it's light-filled windows, boasts two queen size beds and another bath with a single vanity and tub/shower combo. AMENITIES INCLUDE: 2 adult bikes provided. Complete Clean Linen Participant - ALL linens, including comforters laundered upon every checkout. We love Watersound and especially enjoyed this house. The location is perfect for the beach club and also Bruno’s pizza. The house was just perfect for our family of 6....bonus is our 2 year olds pack n play fit just perfect in the master bathroom, giving her a quiet dark room to sleep in!!! We will for sure book this house again when we go back to Watersound!!! We are so glad you enjoyed your vacation! 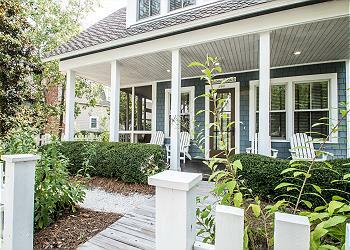 We agree that the Watersound community is perfect for a relaxing yet fun-filled beach vacation! We look forward to hosting you and your family again in the future and hope to see you again very soon! We really like the area and the new pool and restaurant area is very nice. However, the house we stayed in left something to be desired. Very outdated. The television in the master bedroom wouldn’t turn on and the one in the living room was old and difficult to hear. The beds in the upstairs bedroom were very old and sunk in the middle. I would never stay in this house again unless some updates are done. On the other hand, my daughter had a very comfortable house with all they could want or need.